There’s an old saying that goes “the best laid plans of mice and men go asunder” and another that states, “Trouble always comes in threes”. Both are statements that plagued me over a three week period as I battled with the elements to complete this test. And at the time of writing the Modern Boating team had finally bagged this test, but the planned cover shoot to accompany it was still at the will of the gods. There’s also another irrefutable fact in publishing; deadlines and Christmas breaks wait for no man. We just couldn’t believe it, the Sydney region, like most of Australia, was in the middle of the worst drought in more than 100 years. But it seemed that as soon as we mentioned the word chopper, over came the clouds. And while it didn’t rain the bad light made the conditions lousy for photography. The first planned day for the shoot was cancelled when four days before the event a huge band of dense cloud crossed the Western Australian coast and headed for Sydney destroying all chances of a shoot. At least for the second attempt we got to the day before the shoot was scheduled before canning it, because of clouds. Now, here we were trying for our third attempt at a home run and according to the weather bureau we were on a sure thing but. During the night a high-pressure system off the east coast blew strong nor’ easterly winds onshore over northern NSW. These picked up a small cold front out west, which caused cooler sou’ westerly winds to blow across the Sydney Basin and you guessed it, with the southerlies came the clouds. But the bureau still insisted the clouds would lift by mid morning, so we went for it. My instructions to the photographer and pilot were to lift off as soon as the clouds broke and we’d rendezvous in Broken Bay. Ah, the best-laid plans of mice and men ? it didn’t happen. The clouds never lifted, the photographer and pilot wasted more than half a day sitting around on their pats, while the rest of the team were feeding the ducks at the Berowra Waters Marina. May be next week? But all was not lost. There was a bit of haze and low cloud about at Berowra, but the light was even, so on-water photography would be possible. At least we could put the test in the can if not the cover shot. Over my years of testing boats I’ve come to realise that my first impression of a boat was normally fairly close to the mark. And my first impression was this new blue and white-hulled 285 Bayliner looked sensational. Not only had Bayliner done away with the bland white hulls of the 285’s forerunners, gone too was the Ciera model nametag. Greg Wright from Berowra Waters Marina met the team at the refuelling dock. And, because there were a few breaks in the clouds, we pushed off immediately to take full advantage of the brighter conditions. Heading off down Berowra Creek and past the 4 knot zone, I opened the 285 up and the Bayliner Sequential Lift hull had her up and planing quickly. Her hull reacted instantly when I trimmed the sterndrive leg out, lifting the bow and allowing her to cruise along effortlessly at 22 knots pulling 3500rpm. The test boat was also fitted with trim tabs, but these would only be required for lateral trim when carrying unbalanced loads. The steering was smooth and light, but what impressed the team most was the way we could throw almost 30 feet of boat around like a ski boat. Tight figure of eights, 180 degree turns at full throttle, nothing phased her. There was no propeller cavitation, or tail slip and she’d turn almost in her own length. From anywhere in the power range when the throttle was pushed forward the acceleration pushed us back in our seats. She delivered almost sportsboat-like performance. Obviously, the 6.2lt V8 MerCruiser, driving through a Bravo III leg, was an ideal choice of power for this hull. Speed to rpm were: 8 knots at 2000rpm; 13.5 knots at 3000rpm; 22.5 knots at 3500rpm; 28 knots at 4000rpm; and 36.5 knots at WOT (5000rpm). Rough and choppy water didn’t faze the 285. The deep-vee hull sliced through the chop cleanly and the resultant spray was thrown away from the hull giving a smooth and dry ride. Overall, the performance and handling of the Bayliner 285 was extremely good. But she’s more than just a fun boat to drive, the design and clever layout gives more internal room than you’d find on most 30 footers. Step through the transom door into the aft cockpit and you stand in an area that is large enough to be used for some serious fishing. The rear lounge folds down when not in use and the gunwales are high and appropriate to brace against when fighting a fish. There’s also a tap and sink unit on the starboard side, so you can wash your hands after landing that big one. When not in fishing mode a removable table fits between rear lounge and the two-way navigator’s seat. Its backrest folds forward or aft and there’s a padded extension that continues through to the main cabin bulkhead. This lounge also opens out into a sun pad for those wishing to soak up a few rays. With the clears in place it can also be used as a fifth bed. Under this seat there’s a purpose-designed cavity for a portable Esky. Under this is a fold out footrest for a passenger using the navigator’s seat with it facing aft. Fitted to the test boat was an optional stainless steel BBQ, which clips easily onto a rail, mounted on the port gunwale. There was also a handy transom shower to wash you off after a swim, or to wash fish slime off the deck. The cockpit floor and helm station is fitted with clip-in carpets. 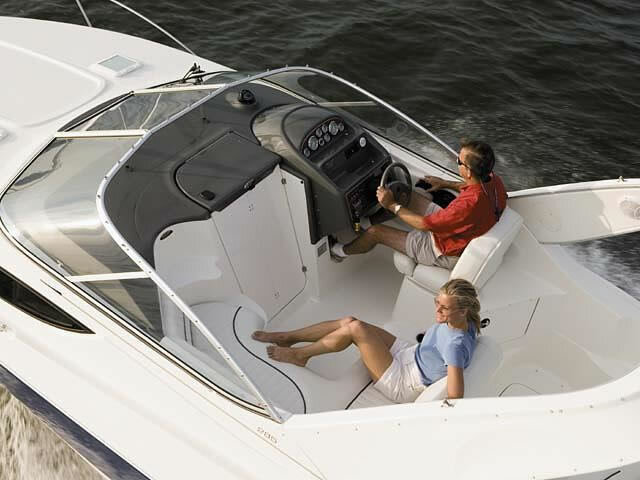 The driver’s seat is a flip-up bolster seat that allows the skipper to stand comfortably when driving if they wish. The Bayliner 285 has a full compliment of gold-rimmed Faria gauges for the engine, plus a digital sounder, compass and VHF radio. Down in the main cabin the layout is open-plan with a fully equipped galley to port, a dinette and head to starboard and a huge island double bed in the bow. Under the helm sole is the amidships’ double cabin with its opening window for ventilation and a lockable door. This cabin is also quite spacious. There is a hanging locker in the amidships cabin, but none in the main cabin ? not that there is a lack of storage onboard this boat. The storage cupboard above the sink in the galley and the toilet in the bathroom, have sliding black Perspex doors. While these are a bit flimsy and would probably pop out if pulled on too hard, they do keep their contents contained. There are three Bomar hatches for ventilation in the roof of the main cabin, all with fly screens and large side windows to port and starboard. Out on the foredeck the bow rail is high enough to offer security when you’re moving around, while a remote windlass alleviates the need to go forward when anchoring. In the past, Bayliner bowsprits were an integral part of the hull, but these days a stainless steel version is fitted after the hull is moulded. All I’ll say is I wish they would go back to the old bowsprit set-up. It was more practical and looked 100 per cent better. But don’t get me wrong, all of the team had nothing but praise for the Bayliner 285. Her two-tone hull looked great, she had enough grunt to keep the rev heads more than happy and her ski boat-like handling blew us away. As an extended cruiser she’d be great for a few days away cruising the islands, but if you’re into long showers you’d have to plan in advance where you were going to top up her 125lt freshwater tank. But the really good news is that you can be anchored up and listening to beautiful music drifting through the boat’s Stereo CD sound system for well under $160,000 ? only $155,690 to be exact. That’s excellent value for money for a 28′ vessel that has as much room onboard as most 30 footers. Standard power for the Aussie version of the Bayliner 285 is a 6.2lt V8 MPI MerCruiser, although the 350 MAG MPI 5.7lt V8 through a Bravo III leg is available as an option. The Bayliner’s engine bay is below the aft cockpit sole. By pulling out the clip-in carpet and lifting the engine hatch on its gas-assisted struts, you can easily get at the engine for daily fluid checks and routine servicing. There is also a hot-water service, separate starter battery and twin house batteries sited here, all mounted above the bilge water level, which is controlled by an automatic bilge pump.